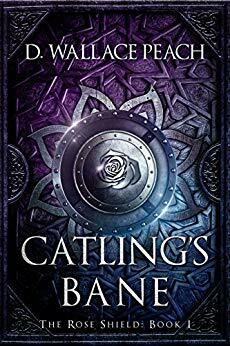 Catling’s Bane, Book 1 of the Rose Shield series, offers the reader an amazing journey into a world so believable that the characters seem to come alive on the page. This beautifully written science-fiction pulled me into a world that glitters with luminosity. The author reveals this world with descriptions so vivid, so rich in detail, that we forget completely, that it is a fictional world. It is a civilization very different than our own, yet still, very much the same, with problems of great poverty, injustice, and cruelty, with one exception. There are strange powers of influence, powers that control someone’s intent, beliefs, and thoughts. The poor live their lives in a caste system, while the wealthy and powerful live like royalty, and all others live by hook or by crook. Yet, even for the wealthy, life becomes a perilous journey, because every word, ever thought, may not be their own. There are those, however, within this system, who have courageous hearts, make great sacrifices, and if they can escape the Influencers, they may have the opportunity to change their world where everyone can speak their own thoughts and live their lives as they choose to be. Thank you, Karen. You’re so sweet in your comments. I hope if you go on with the series you find the rest just as entrancing. Happy Writing, my friend, and keep being you! My sentiments exactly! I didn’t write 2 reviews for her book – Soul’s swallowers – but i had so o much to say, I had trouble narrowing it to an acceptable length. Great review! Diane…thank you so much for your great storytelling gifts. A wonderful review of Diana’s book, Karen. Thanks for checking out Karen’s review, Miriam, and for the kind comment. So appreciated. Have a lovely week! You’re welcome, Diana. Have a wonderful week! Pleased to hear that, Diana. Every little bit helps! What a wonderful gift you have for words. Thanks so much, Jacqui. Happy Writing! Thanks again, Anneli, for visiting Karen’s site and the wonderful comment! I really did love it, and the next one too. Wonderful review! I’ve had Catling’s Bane on my kindle for quite some time… must move it up and share the review! I loved this book, too, and fantasy is not a genre I usually read. Diana has woven an intriguing tale and built a fantastic world. What an imagination she has! Thanks, Julie. Yes, there’s always that pull on our time. I’d planned to read why away taking care of my parents. What was I thinking???? Ha ha. Happy Writing, my friend.